The words ‘diversity’ and ‘inclusion’ are becoming increasingly commonplace, with the intent of eliminating discrimination and inequality in the workplace and society at large. But, what do these words really mean? How does the IES interpret them? 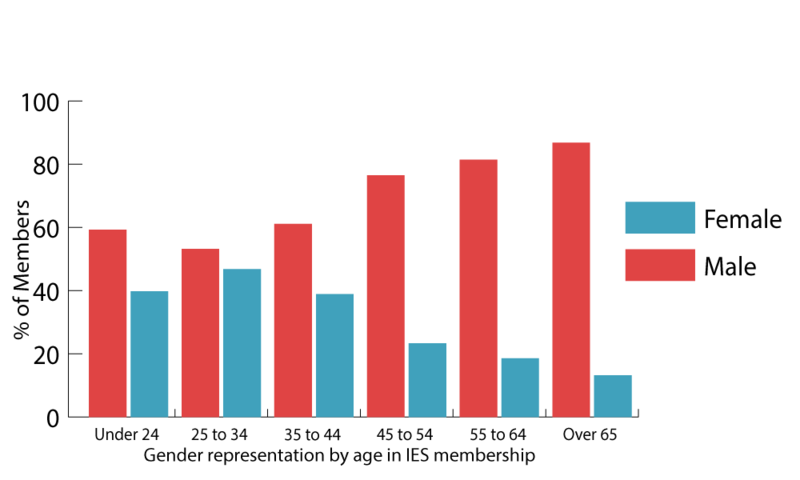 The IES defines diversity as all the visible and invisible differences between people’s identity and background, whether it be age, gender, ethnicity, disability, religion, sexual orientation, socioeconomic status, or otherwise. We characterise inclusion as the environment in which diversity is valued. As the professional body for environmental science, we believe it is our responsibility to take action in ensuring that both diversity and inclusion are upheld within and across the sector. To do this, we need to understand the current state of the discipline, and identify where and how progression can be made. Over the last few years, our ambition has been to increase the diversity of our membership, registrants, governance, and staff. In 2015, the IES proudly signed the Science Council Declaration on Diversity, Equality and Inclusion; a cross-organisational commitment designed to advocate the importance of representation within the scientific community, and challenge prejudice and discrimination across our respective disciplines. With the ethos of diversity in place, it was time to act. Our work in this area has been shaped by a collective benchmarking exercise, the Diversity and Inclusion Progression Framework, developed by the Science Council and Royal Academy of Engineering. The overall aim of this Framework is to determine a baseline for diversity, equality and inclusion across the sectors, identify barriers to participation, and evaluate the efficacy of diversity policies upheld by membership organisations. The Framework provides professional bodies with the tools to comprehensively measure and track their progress across membership, employment, governance and beyond. Each section required evidence of policies, practices and statistics, as well as deeper exploration of current challenges and ongoing priorities. Although the official report is yet to be finalised, the IES submitted their preliminary findings and action plan to the Science Council at the beginning of October. This blog outlines some of the content of that submission. In the last two years, the Institution has initiated campaigns to increase the representation of women within our Fellowship grade, and Chartered Environmentalist and Charted Scientist designations, which presently see proportions of 21%, 36% and 33%, respectively. Similarly, we have sought to enhance the distribution of age across our membership, ensuring access is available to students, graduates, retirees, and professionals at all levels. In 2016, we developed the Women in Environmental Science Steering Group with the aim of identifying key barriers to gender parity in the IES and the environmental sector at large. 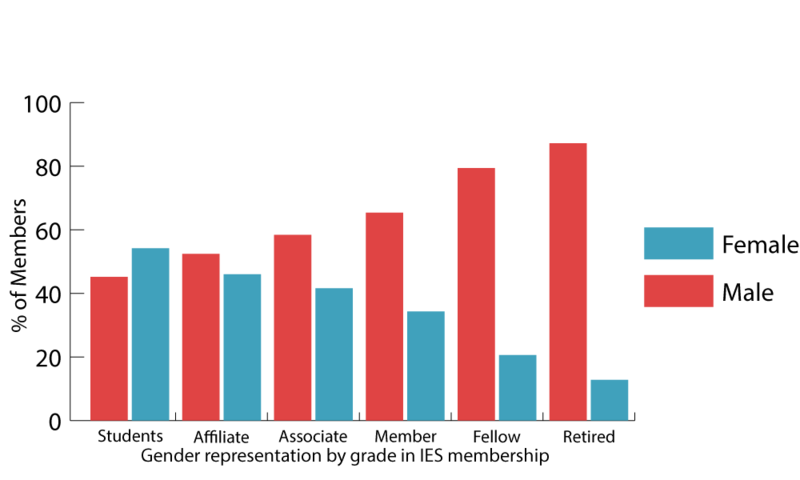 The group collectively explored the intersections between gender and age, and gender and membership grade, across the IES membership. In both cases, the results almost perfectly indicated a positive, linear correlation of male representation with increasing seniority/age, alongside corresponding negative correlation for females. Notably, the only group which exhibited a higher ratio of females to males in any category were students enrolled on our accredited programmes. Identifying the cause of this emergent trend is a challenging task. On one hand, it may demonstrate diminished access to career progression for women in the environmental sector. Contrastingly, it may indicate a societal shift in the way women are perceived in labour markets and STEM disciplines. Whilst we can only look speculatively for now, with ongoing collection and monitoring of these metrics, the underlying drivers will hopefully start to become more apparent. It is important to note that, at present, the Institution only monitors the ages and perceived genders of its members. However, these characteristics do not solely demarcate diversity. As stated previously, diversity encompasses a wide range of identities and backgrounds. Furthermore, how these characteristics intersect with one another broadly impacts individual experience. As a result, the Institution must do more to understand the identities of its members, with intersectionality in mind, so it can better serve these communities and reduce potential obstructions to parity in its membership and the environmental sector as a whole. How do we intend to champion diversity across the sector? The only way we can know whether the environmental sector is diverse is if we measure it. With adequate benchmarking and continual monitoring, we are better equipped to recognise where potential barriers lie, and how best to augment our own practices and influence the practices of others. Improved understanding and policymaking will ensure the IES are the sectoral pioneers in developing best-practice. Over the next few months, we will be asking all new and existing members – our most easy-to-reach subsection of the sector – to complete our diversity monitoring exercise. This information will be solely used to monitor the effectiveness of our diversity work, widen participation, and provide us with a benchmark for our membership to compare against the sector. Furthermore, this initiative aims to lead the way in ensuring other organisations and professional bodies regularly monitor and evaluate the diversity of their own subsections of environment, providing even broader insight into the inclusivity of the sector. The survey will include five questions on ethnicity, disability, gender, religion and sexual orientation. No member will be obligated to answer all or any of these questions, if they do not wish. Whilst participation is optional, it is wholeheartedly encouraged. We recognise that the collection of these metrics can provoke suspicion due to historically-entrenched discrimination some communities face. However, we will ensure all individualised data remain strictly confidential to a limited number of IES staff, and will never, under any circumstances, be passed on to a third party or used in any way which could enable any individual to be identified or discriminated against. To further reiterate this point, the data will not be available to any of our assessors on the Application Review Panel. Over the next 12 months, we will be turning our attention toward businesses, academia, government, and NGOs to benchmark the demographics of environmental professionals sector-wide. We aim to act as transparently as possible, ensuring our overall findings and actions are communicated to our members and the public at every turn. In my next blog, I will be looking at the Institution’s performance on diversity in governance, employment and recruitment.